UK pilots have accomplished some epic winter flights, inspired by the legends of yesteryear. 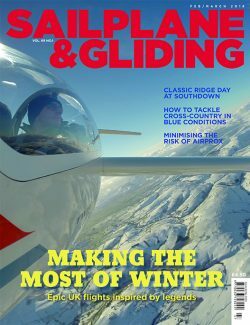 Read about them in the Feb/March issue of S&G, which also has top tips on how to tackle cross-country in blue conditions and good advice on steps to take to minimise the risk of Airprox. Just a few weeks later, with a glorious first of December forecast, pilots travelled from throughout the UK to get a good spot on the launch queue at Southdown. The day had everything: a 22kt north wind, brilliant sun and crystal clear visibility. There were 37 launches that day. Craig Lowrie completed two runs: Butser to Eastbourne, and Butser to Lewes – that’s an impressive 400km in December. Nigel Mallender completed two double runs in an LS8, Butser to Lewes, each 340km. He achieved these at the speeds of 149km/h and 137km/h. The enjoyment of romping round a task with the sky lit up with cu can turn sour when the sky ahead turns blue. There’s plenty of evidence that flights can be made in the blue, so what steps should we take when facing a cross-country in these conditions? Tony Cronshaw talks to coach Kevin Atkinson about clues to look for to help us know if the blue is thermic and techniques to make soaring in the blue a logical problem-solving process. Wherever you fly, it is essential to keep a good lookout to avoid a collision in the air. It’s been another quiet year for glider-involved Airprox, but it is important for us not to become complacent. Chris Fox and Ed Downham represent gliding on the UK Airprox Board and offer some good advice on how we can maintain our good reputation and minimise the risk of future Airprox. Also in this issue: Tim Freegarde tells us what electronic conspicuity system ADS-B is all about. Ebenezer Grimshaw breaks taboos, dispels myths and restores reality for newbies. Peter J Holloway has written a futuristic short story about club briefings in the year 2090. Jakob Hlavácek takes the winning photograph in Deeside’s annual competition. David Innes provides an update on the impact of the EuroFOX at Aboyne. Alan Lapworth investigates a rare atmospheric bore. Yvonne Elliott highlights how bursaries can help young pilots achieve a career in aviation. Paul Conran introduces the contenders for the 2018 Aerobatic Worlds. Rob Faulkner and Phil Lazenby reflect on some vintage rally moments. John Williams highlights a growing airspace problem. And there are many more of your stunning images in the Gallery pages. ADS-B: the way ahead for GA?